"We live in a very sick world. The fact is, I'm very uncomfortable with us living the way we do...totally unprotected." In the early 1990s, a number of independent films by women directors were released, among them works by Allison Anders, Martha Coolidge, and Tamra Davis. Although many of these directors had to suppress any feminist ideology to get their films made, for a brief few years there was the promise (unfortunately, mostly unfulfilled) for a more female-centered point of view than was typical in the indies of the time. 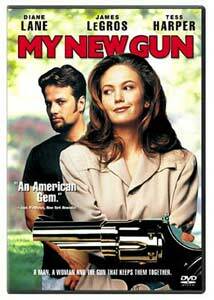 One of the most interesting of these films, Stacey Cochran's My New Gun has finally made its belated DVD debut, courtesy of Columbia Tristar Home Video. Diane Lane stars as Debbie Bender, wife of the overbearing and insensitive Gerald (Stephen Collins). They're best friends with Gerald's radiologist partner Irwin (Bruce Altman), and his near-child fianc�e Myra (Maddie Corman). Irwin's just presented Myra with the gift of a personalized gun, and Gerald follows suit. But Debbie doesn't want it�it's distracting her so much that she can't make love to Gerald, and when she wakes up screaming from a nightmare, it takes a call from their neighbor Skippy (James LeGros) to calm her down. Skippy's a bit of an enigma�despite working in a burger joint, he carries around large amounts of cash, so when he "borrows" the gun unbeknownst to Debbie, the disapproving and suspicious Gerald hits the wall. Furious with Skippy, he demands the gun back, only to have an accident that lands him in the hospital. With Gerald out of the picture, Debbie has time to investigate more of Skippy's mysterious life (just who is that woman living in his house?) as well as take advantage of their increasing attraction for each other. Cochran also wrote the script, and she takes an interesting narrative tack here. Most of the film concerns Debbie's attempt to piece together why Skippy wants the gun, but our understanding of the mystery evolves in spurts, as we're given bits and pieces of information from several points of view. By the end of the film, we come to realize that there has been an excess of clues, and that the primary motivation is in fact quite simple. But at the same time, questions are left unanswered and characters are left dangling, never so much as to prevent a satisfactory closure, but enough to give added complexity and resonance to the solution. There's a mild, but never biting, feminist critique in the film. There's a certain Stepford Wifes-like quality to Debbie's existence in sterile suburbia, as she first kowtows to Gerald, then suffers his abandonment of her at a crucial moment, in a scene that also shows Irwin's unthinking lack of sensitivity. Myra's seen as little more than an innocent, and even Skippy's pill-popping mom (Tess Harper) is portrayed with sympathy. On the other hand, Gerald's so oblivious that he doesn't even notice Skippy's obvious flirtation with Debbie, and how she welcomes the attention. In a film that's filled with good performances, James LeGros must be singled out for his wonderful performance as Skippy. With his slightly slow speech patterns and innocent charm, he's a boy in a man's body, yet capable of undercutting the pompous Gerald with exaggerated (and obvious, to everyone but Gerald) politeness. LeGros does an excellent job, and rest of the cast contribute solid and enjoyable performances. Women directors have always had a hard time of it in Hollywood, and unfortunately those on its margins don't seem to fare much better. My New Gun is by no means a great film, but it's amusing and quirky, and it's a shame that Cochran has only been able to make two features since its release in 1992. Image Transfer Review: Ed Lachman is a great cinematographer, but you'd never guess from this transfer. The image is mostly soft and colors look flat, without much detail. The color balance is off, and skin tones are consistently either too yellow or too orange. There is some edge enhancement, and minor compression artifacts are visible throughout. Audio Transfer Review: The two-channel Dolby sound is fine. The dialogue is at all times clear, and although there isn't much dynamic range, Pat Irwin's mocking score comes through fine. Extras Review: The anamorphic previews play sequentially. 13 Going on 30 and Big Fish look and sound great, with My Best Friend's Wedding's two-channel mix not sounding as good. Spanish subtitles are provided. Stacey Cochran's My New Gun is a quirky mystery with comedic touches and an interesting narrative style. This is a film worth seeing, so it's a shame that the transfer is substandard, and that there are no relevant extras.